Knit in an overall Seed Stitch and embellished with large-hole craft store beads, this eye-catching pillow will add a touch of elegance and whimsy to any holiday (or everyday) décor! Knit from Knit Picks Bare Peruvian Highland Wool Bulky, the gauge for the pattern is 27 stitches = 6 1/4” in Seed Stitch. This is intentionally slightly tighter the the suggested gauge for this yarn, to ensure a firmly knit fabric. The pillow as shown used 3 skeins of Bare. 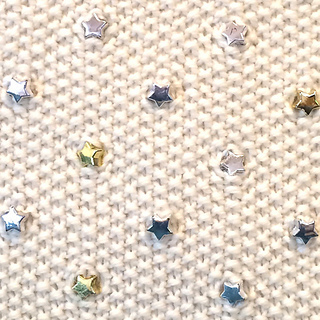 Shining Stars covers a 16” pillow form with knit-in stars. It is knit in one piece and sewn together on three sides. The pattern contains step-by-step instructions, with photos, for knitting in the stars, as well as for finishing the pillow using a 16” pillow form. 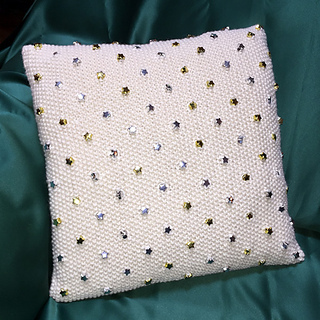 Create this pillow to suit your décor—elegant off-white embellished with silver and gold beads, or a festive color yarn with multi-colored stars. 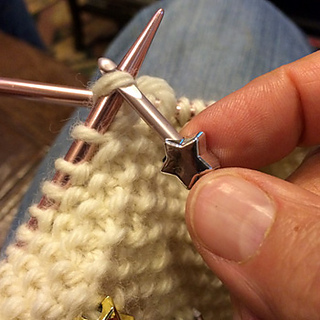 Add stars randomly as you knit, or follow the pattern as given, alternating placement of beads every 8 rows. Note: A Size E crochet hook was used for knitting in the beads. If smaller (or larger) hole beads are used, the crochet hook may need to be adjusted as needed. You can easily modify the pattern stitch to fit other size pillow forms. As long as you cast on an odd number of stitches, every row of the pattern stitch is the same! Beads for this project can be found in Michael’s stores, or online at Michaels.com (Item# 10442720, $4.99 per package). They come in multi-color packages. To make the pillow as shown, simply pick out the gold and silver beads. Purchasing two packages is recommended to make sure there are enough beads in those colors. 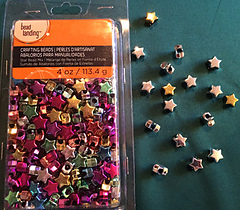 For random color embellishments, one package should provide plenty of beads. This pattern is suitable for an intermediate-level beginning knitter, comfortable with working in Seed Stitch.